I study materials for electrochemical energy conversion and storage devices, including batteries and fuel cells, primarily using transmission electron microscopy and electrochemistry. I work at Cornell University in the lab of Professor David Muller. My PhD research projects have included investigating the performance and durability of proton exchange membrane fuel cell catalysts using scanning transmission electron microscope (STEM) imaging, 3D electron tomography, and electron energy loss spectroscopy (EELS); developing improved techniques for electron tomography of nanoparticles; and investigating the atomic and electronic structure of lithium ion battery materials with atomic-resolution STEM imaging, EELS, and convergent beam electron diffraction (CBED). E. Padgett, V. Yarlagadda, M.E. Holtz, M. Ko, B.D.A. Levin, R. Singh Kukreja, J.M. Ziegelbauer, R.N. Andrews, J. Ilavsky, A. Kongkanand, D.A. Muller, “Mitigation of PEM Fuel Cell Catalyst Degradation with Porous Carbon Supports”, Journal of the Electrochemical Society, doi: 10.1149/2.0371904jes (2019). Y. Xiong, Y. Yang, H. Joress, E. Padgett, U. Gupta, V. Yarlagadda, D.N. Agyeman-Budu, X. Huang, T.E. Moylan, R. Zeng, A. Kongkanand, F.A. Escobedo, J.D. Brock, F.J. DiSalvo, D.A. Muller, H.D. Abruña, “Revealing the atomic ordering of binary intermetallics using in situ heating techniques at multilength scales”, Proceedings of the National Academy of Sciences, doi: 10.1073/pnas.1815643116 (2019). E. Padgett, N. Andrejevic, Z. Liu, A. Kongkanand, W. Gu, K. Moriyama, Y. Jiang, S. Kumaraguru, T.E. Moylan, R. Kukreja, D.A. Muller, “Editors’ Choice—Connecting Fuel Cell Catalyst Nanostructure and Accessibility Using Quantitative Cryo-STEM Tomography”, Journal of the Electrochemical Society, doi: 10.1149/2.0541803jes (2018). Y. Jiang, E. Padgett, R. Hovden, D.A. 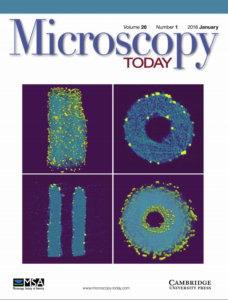 Muller, “Sampling limits for electron tomography with sparsity-exploiting reconstructions” Ultramicroscopy, https://doi.org/10.1016/j.ultramic.2017.12.010 (2018). R. Rizo, R. Arán-Ais, E. Padgett, D. Muller, M.J. Lázaro, J. Solla-Gullon, J.M. Feliu, E. Pastor, H.D. Abruña, “Pt-richcore/Sn-richsubsurface/Ptskin nanocubes as highly active and stable electrocatalysts for the ethanol oxidation reaction”, Journal of the American Chemical Society, doi: 10.1021/jacs.8b00588 (2018). B.D.A. Levin, Y. Jiang, E. Padgett, S. Waldon, C. Quammen, C. Harris, U. Ayachit, M. Hanwell, P. Ercius, D.A. Muller, R. Hovden, “Tutorial on the Visualization of Volumetric Data Using tomviz“, Microscopy Today, doi: 10.1017/S1551929517001213 (2018). E. Padgett, R. Hovden, J.C. DaSilva, B.D.A. Levin, J.L. Grazul, T. Hanrath, and D.A. 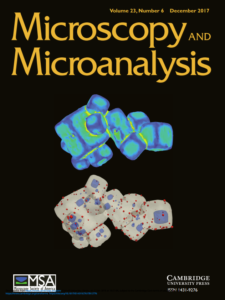 Muller, “A Simple Preparation Method for Full-Range Electron Tomography of Nanoparticles and Fine Powders” Microscopy and Microanalysis, doi:10.1017/S1431927617012764 (2017). V. Beermann, M. Gocyla, S. Kühl, E. Padgett, H. Schmies, M. Goerlin, N. Erini, M. Shviro, M. Heggen, R.E. Dunin-Borkowski, D.A. 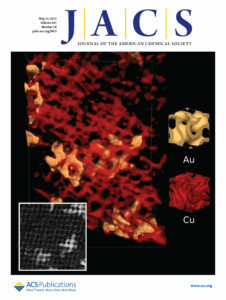 Muller, P. Strasser, “Tuning the Electrocatalytic Oxygen Reduction Reaction Activity and Stability of Shape-Controlled Pt–Ni Nanoparticles by Thermal Annealing − Elucidating the Surface Atomic Structural and Compositional Changes”, Journal of the American Chemical Society, DOI: 10.1021/jacs.7b06846 (2017). A.M. Pasqualeti, E. Padgett, D.Y. Kuo, D.A. Muller, F.H.B. Lima, J. Suntivich, “Influence of Aliovalent Substitutions on Oxygen Reduction on Tantalum Oxynitrides”, Journal of the Electrochemical Society doi: 10.1149/2.1361706jes (2017). J. A. Mundy, C. M. Brooks, M. E. Holtz, J. A. Moyer, H. Das, A. F. Rébola, J. T. Heron, J. D. Clarkson, S. M. Disseler, Z. Liu, A. Farhan, R. Held, R. Hovden, E. Padgett, Q. Mao, H. Paik, R. Misra, L. F. Kourkoutis, E. Arenholz, A. Scholl, J. A. Borchers, W. D. Ratcliff, R. Ramesh, C. J. Fennie, P. Schiffer, D. A. Muller & D. G. Schlom, “Atomically engineered ferroic layers yield a room-temperature magnetoelectric multiferroic”. Nature 537, 523-527 (2016). A.L. Graves, S. Nashed, E. Padgett, C.P. Goodrich, A.J. Liu, J.P. Sethna, “Pinning susceptibility: the effect of dilute, quenched disorder on jamming”, Physical Review Letters, DOI: 10.1103/PhysRevLett.116.235501 (2016). B.D.A. Levin, E. Padgett, C-C. Chen, M.C. Scott, R. Xu, W. Theis, Y. Jiang, Y. Yang, C. Ophus, H. Zhang, D-H. Ha, D. Wang, Y. Yu, H.D. Abruña, R.D. Robinson, P. Ercius, L.F. Kourkoutis, J. Miao, D.A. Muller, R. Hovden, “Nanomaterial datasets to advance tomography in scanning transmission electron microscopy”, Sci Data, 3, 160041 (2016). C.D. Cowman, E. Padgett, K.W. Tan, R. Hovden, Y. Gu, N. Andrejevic, D. Muller, G.W. Coates, and U. Wiesner, “Multicomponent Nanomaterials with Complex Networked Architectures from Orthogonal Degradation and Binary Metal Backfilling in ABC Triblock Terpolymers”. J. Am. Chem. Soc. 137, 6026-6033 (2015). See my Google Scholar profile for a complete list of co-authored publications and citations.